My husband and I were on a trip to Israel a few years ago when we stopped at an amazing Arabic restaurant in Jerusalem. And of all the fantastic foods that I got to try on my visit, I will never forget the fattoush salad I had there. IT WAS AMAZING. While we were at the restaurant, I had the chance to be introduced to the owner’s friend. We had a great chat about some foods and seasonings that are central to Arabic culture, so as soon as I returned to the US, I got into the kitchen and got to work. I wanted to recreate this amazing salad with it’s fresh mint, parsley, cucumbers, tomatoes, onions and pita bread. I just had to recreate the tangy dressing and top it all with crumbled feta cheese. You may have never heard of fattoush, so let me tell you a little more about it. Fattoush is a Lebanese salad that is made from pieces of toasted or fried pita, mixed greens, veggies and seasonings. It frequently contains lettuce, tomato, cucumber, onion, mint, olive oil, sumac and of course, pita bread. Traditionally, fattoush is used to use up pita bread that has become stale. In many ways, it’s like tabbouleh, which is a vegetarian salad with tomatoes, mint, parsley, onion and bulgur wheat. Tabbouleh is a staple at our house, and I’ve got a great recipe for it. I’ve also made a Quinoa Tabbouleh and a Paleo friendly Cauliflower Tabbouleh as well. Unlike tabbouleh, where the ingredients are very finely diced, fattoush is more like a tossed salad, where the veggies are more varied and roughly chopped. Now that you know a little more about what fattoush is, let me tell you about one of the key ingredients – sumac. Sumac is a spice that comes from a red flowering plant. The fruit of the pant is dried and powdered and turned into the spice Sumac. It’s commonly used in Middle Eastern and South Asian cuisine. It is a dark red/purple spice that adds a tart, lemony taste to your dish. And trust me when I tell you, it was the sumac that sealed the deal and made this Arabic Fattoush Salad so incredibly delicious. I love how easy this salad is. Chop everything up and you’re ready to serve it in just 15 minutes – it doesn’t get better than that! Or at least, it doesn’t until you dig in. It’s not only beautiful, colorful and easy to make – it’s amazingly delicious. Fresh mint and parsley combine with the cucumbers, tomatoes and red onions to bring a delicious combination that is fresh and light. I used just one piece of whole wheat pita bread that I toasted (and it was fresh, not stale). It was the perfect amount to add the traditional flavor of the pita bread to the salad but didn’t add a lot of points to my salad. Then you have the dressing. It’s tangy with the fresh lemon juice and minced garlic. Seasoned with the sumac, it’s tamed with the olive oil and feta cheese. It’s a perfect combination. I hope you enjoy my recreation of this amazing Arabic Fattoush Salad. This one is a must try! Fattoush is one of the most well-known Middle Eastern salads and is practically a standard at most meals there. It’s a beautiful and colorful salad tossed with fresh vegetables and herbs that offers a delicious combination of flavors. Lightly mist pita bread with cooking spray, and season with a bit of salt. Toast until crisp and golden brown. Chop into bite size pieces. 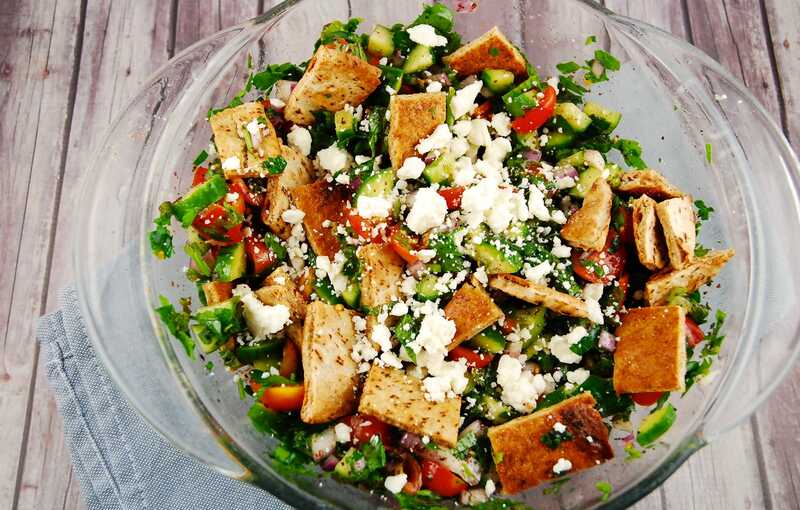 In a large bowl, toss together the remaining ingredients (except for the feta). Top with diced pita and feta cheese.